r' = k1*r + k3*r**3 + k5*r**5 + ........ where k1 is the plate scale at the centre, and k3, k5 etc.... describe the distortion relative to the angular distance on the focal plane. For VISTA k1 = 0.3413 arcsec/pixel (i.e. 17.065 arcsec/mm) and in angular units the distortion coefficients are given quite accurately by k3/k1 = 44 and k5/k1 = -10300 (using angular measures in radians). Higher order terms seem to be negligible. After distortion correction the residuals from individual detector linear fits can be used to monitor the quality of the 2MASS-based astrometric solution which is illustrated in the following summary of fits of individual stars from several hundred pointings across all detectors. The rms in these histograms is around 80 mas and is dominated by the 2MASS rms errors. By stacking residuals from a series of standard astrometric fits such as this the underlying systematics due to imperfect WCS modelling become apparent. An example of this is shown below for the full VISTA pawprint together with the average radial residuals used to test the radial distortion model above. The bottom line is that over the whole VIRCAM field-of-view the current first pass astrometric solutions achieve positions within 25 mas for the entire field. Without the k5 term, the systematic residuals increase to of order 50 mas near the edge of the field. 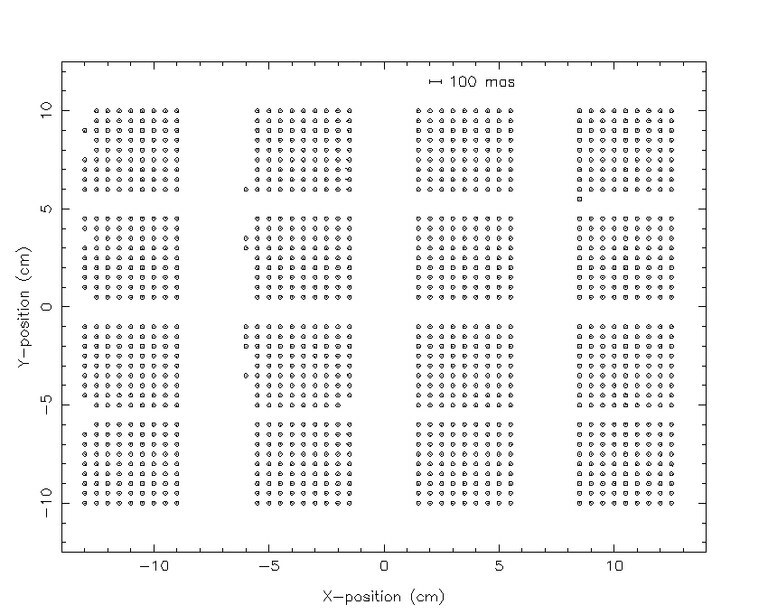 Further refinement of the default astrometric model will be carried out as more on-sky data is acquired. 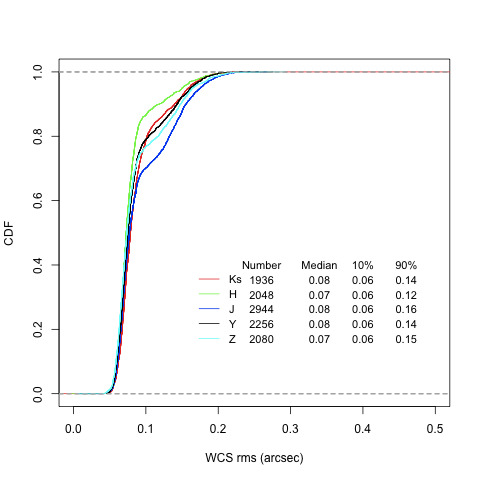 The figure below shows the cumulative density function of WCS rms values on each filter for all chips, using seven nights of science verification data on Oct 2009. For each filter the number of chips used, median and 10% and 90% quantiles are shown. 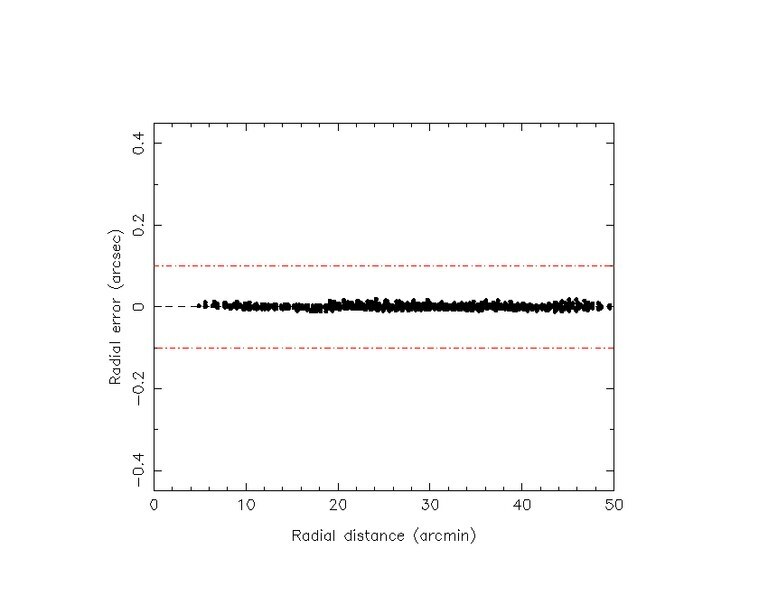 where k1, k3 and k5 are the polynomial coefficients and r is the radial distance. Note that in the VISTA catalogues these are named TV5_1, TV5_3 and TV5_5 to in order to conform to the FITS standard.